Too much smoke and sugar is this sauces downfall, creating an unbalanced flavor out of the jar and easily susceptible to burning on the grill. Back in March I led a series of workshops at the Barbecue Research Center that was put on by GE at SXSW in Austin. The concept of my workshop was simple—take a bottled barbecue sauce and make it a whole lot better by adding just a few ingredients. In preparation for the workshops, I bought a suite of common budget-friendly sauces to find the right one to use as base, which left me with a bunch of bottles of leftover sauce in my fridge that I can now use as fodder for reviews. While I ultimately didn't choose Jack Daniel's Spicy Original for the workshop, this is how I ended up with it. 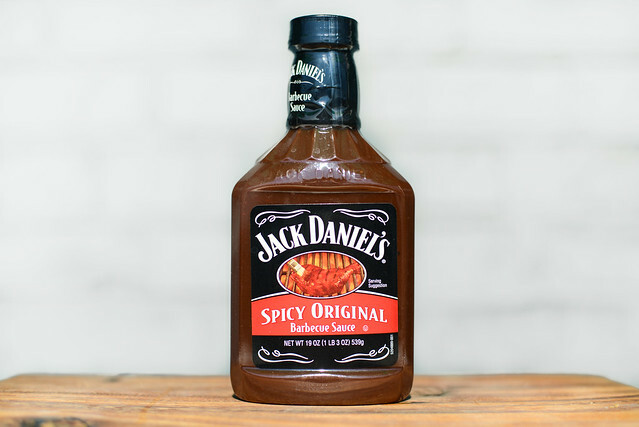 I'm not sure exactly when Jack Daniel's lent its name and whiskey to barbecue sauce, but it's been on the shelves as long as I can remember. The now ubiquitous Lynchburg, TN distillery got its start at the hands of Jasper Newton "Jack" Daniel back in 1866 and the business was formally established in 1875. Sometime since then, someone figured the whiskey can do more than get you drunk, but also lend its unique flavor to sauces and marinades as well. 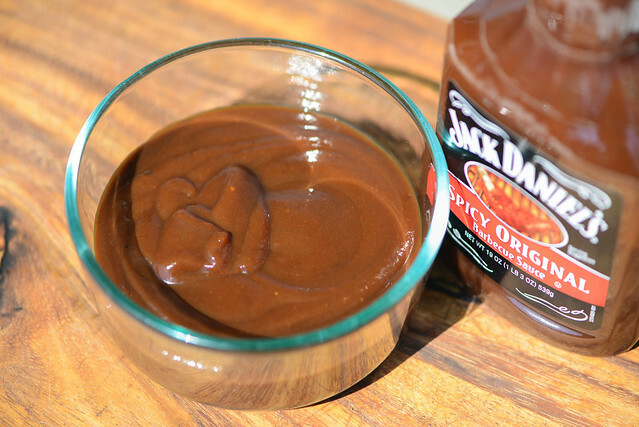 The Jack Daniel's sauce line, produced by Heinz, includes two steak sauces, four marinades, and six barbecue sauces, while another producer handles the varieties of pork, ribs, and brisket that also carry the Jack Daniel's name. You could argue there's a difference between sniffing a bottle of liquid smoke and this Jack Daniel's sauce, but you better be a damn good debater. The first whiff is all smoke, which is so strong that it tip toes into acrid territory. Give your nose more time, and the barbecue base becomes easily apparent. 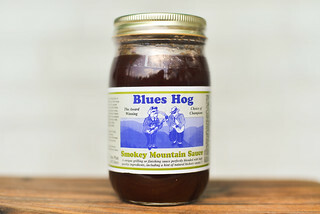 Molasses is the only thing strong enough to stand with the liquid smoke, but behind that a mild vinegar and deep, not sweet, tomato both stand in the near distance. There seems to be a hint of whiskey in there, but it's hard to discern it from the smokiness. This glossy, smooth, reddish-brown sauce weighs in well north of the medium thick line. From a suspended spoon, the viscous sauce releases in a couple large globs, then very slowly, a third, smaller drip of sauce falls, leaving a healthy coating left clinging that obscures the silverware. Since the sauce is dark and opaque, it's hard to make out any spices save the few specs of pepper. Although sweetness was not a defining attribute in the aroma department, it's all you get on first taste. A distinctly sugary corn syrup makes up the initial flavor, which then mixes with a non-sweet tomato paste that oddly doesn't balance with the sugar. Molasses is next to the plate, adding depth to the sugar, while vinegar makes a play to bring needed contrast to the corn syrup. Just as the sauce begins getting pretty tangy, the spices bring a mild onion and garlic flavor followed by a mellow heat that builds up to a nice tingle as the sauce rests on the tongue. A smokiness develops at the end as well, but it was much more mellow than the smell would expect you believe, creating a more balanced tangy, spicy, and smoky aftertaste. Like many thick sauces, this one coated the chicken in an uneven, somewhat globby manner. It baked down well over indirect heat, but began to char a bit before the chicken was done cooking. Once I move the leg to direct heat, the sauce burnt almost immediately. This left the final flavor being burnt and smoky, tasting slightly better than easting an ashtray. The strong sweetness remained, but found a better balance with the tomato than out of the jar. The vinegar and spices retreated through, which didn't help things, making the chicken taste primarily smoky, sweet, and burnt. There was good reason Jack Daniel's didn't make the cut for my workshops—you'd need more than a few ingredients to fix its unbalanced sweet and smoky flavor. It's namesake whiskey has a slight presence that's overtaken by sugar and liquid smoke both in smell, out of the jar, and after being cooked. That alone isn't a reason to ding this sauce points, the real issue is it tastes processed and has so much sugar that it burns too easily on the grill. Out of the fives sauces I had as contenders for a decent base to build upon, Jack Daniel's was a the bottom of the list then, and I remained unimpressed a few months later. 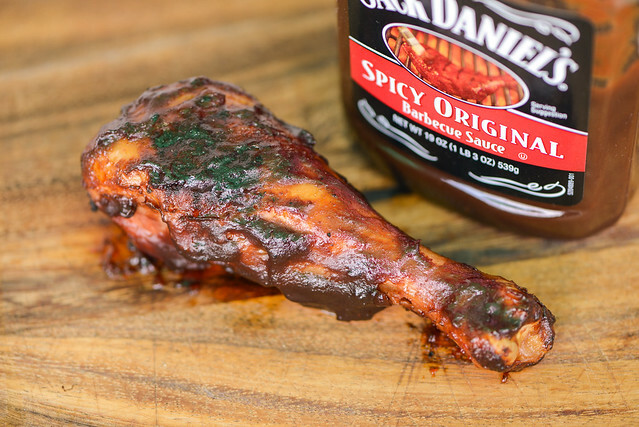 There's better sauces out there in the lot of low cost, supermarket staples that will serve you and your barbecue better than Jack Daniel's Spicy. Completely agree. I have tried this sauce and it is complete crap.